There are very few things that ease the mind better than gardening and then enjoying a glass of wine al fresco soaking in the fruits of your labor! 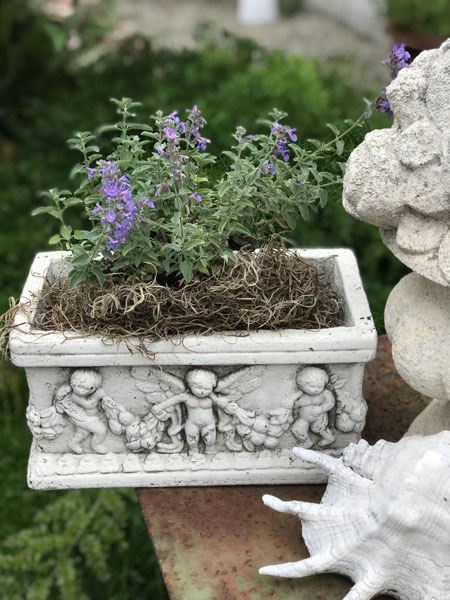 Great little reproduction urn modeled after those found in European Gardens. 10 x 6". Treated metal to prevent rusting. Suitable for indoor/outdoor. Will age in paint over time. New. NOTE: Orders under $25 incur a $2.50 handling fee; orders totaling over $25 and handling fee waived and only pay direct shipping cost. Reg. Price $33.00 $20.00 On Sale, Lucky Dog! 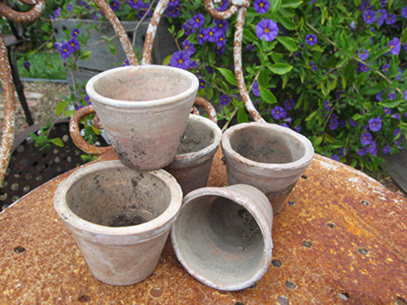 Darling little vintage pots brought back in crates from France. 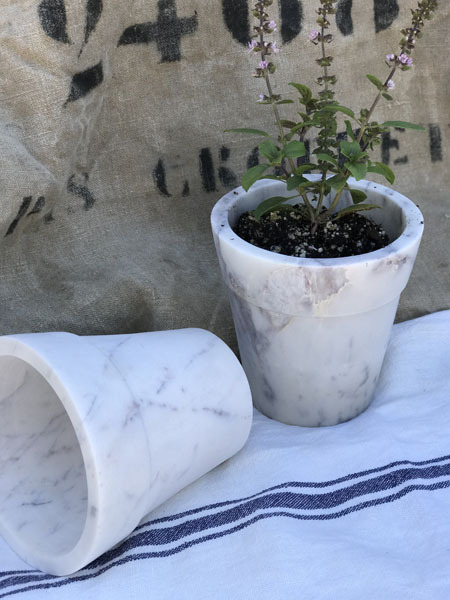 Perfect for starter plants or a windowsill garden! These are vintage so there is minor wear and very few lip cracks but none in base.. Each size varies slightly from 1 3/4 - 3". Set of 5. 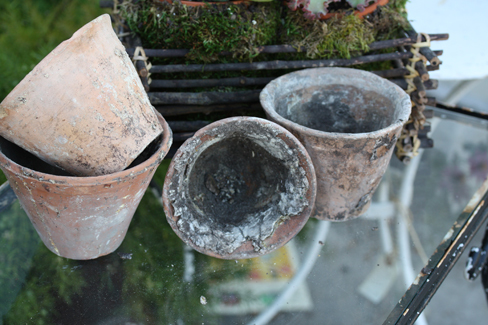 Darling little vintage pots brought back in crates from France. 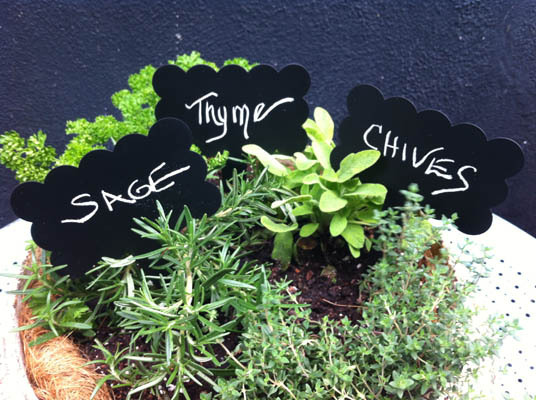 Perfect for starter plants or a windowsill garden! These are vintage so there is minor wear but no cracks. PLEASE NOTE: Each size varies slightly from 3 1/2 TO 4 1/2". Set of 5. 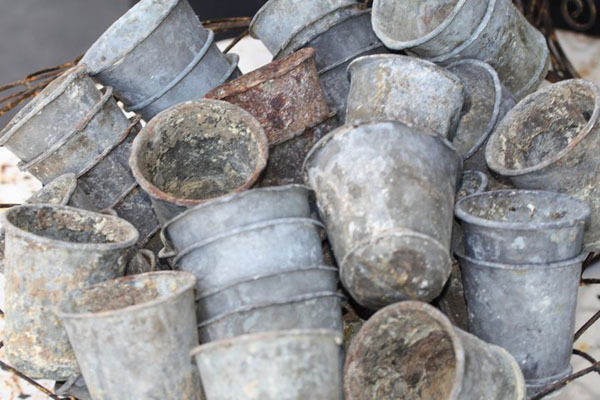 These French zinc pots are getting more and more scare throughout the country, so we were thrilled to find an entire crate full in Aix en Provence. 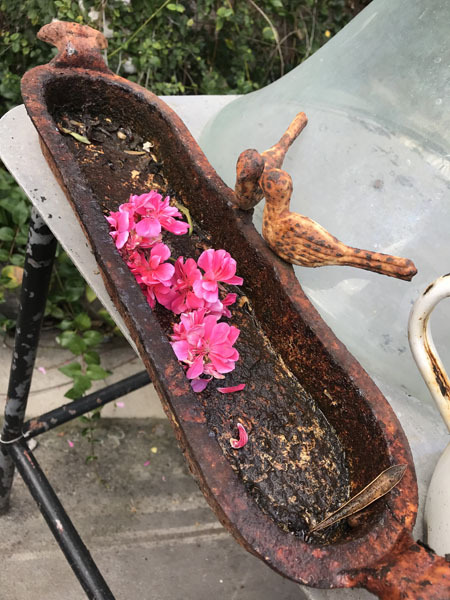 Aged as only the rains and temperature in the South of France can do....no hole on the bottom, but there is a hanging hole to display them hanging from a windowsill as a proper French Jardinier! Approx 3 x 4" (each varies slightly). Slightly bent and slightly rusted. Sold individually. France, early 1900's. 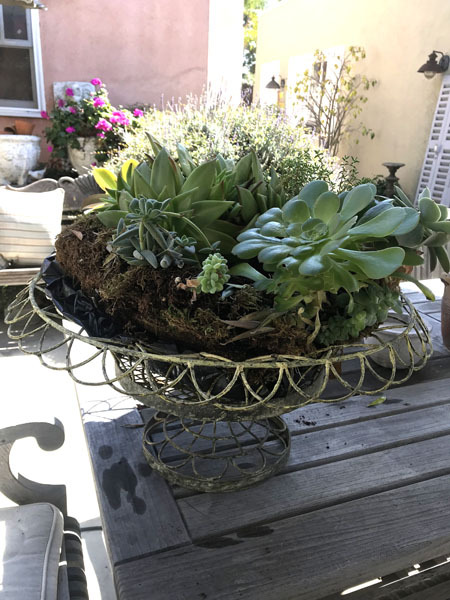 Fabulous French Wire Twist Basket. For our studio clients, this is our go-to "basket" to fill with all kinds of French bath products. Lovely with plants, too!. Power coated to live happily outside as well as in. 12" Tall x 14" W x 8" deep. Handcrafted thus each item will vary slightly. 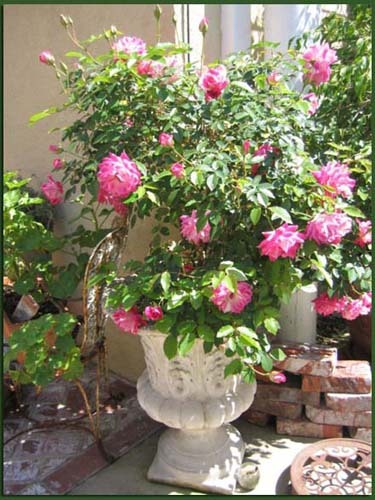 Great little reproduction urn modeled after those found in European Gardens. 10 x 6". Treated metal to prevent rusting. Suitable for indoor/outdoor. Distressed rust for an aged look. NOTE: Orders under $25 incur a $2.50 handling fee; orders totaling over $25 and handling fee waived and only pay direct shipping cost. Fabulous weathered zinc markers, created for Rose Varieties. From an English antique dealer's collection during a recent visit across the pond. Magical addition for the well-tended garden. Overall 11" long; marker measures approx 2.5 x 1.5". Deep cleaning will reveal a blackened marker covered by aged patina (shown as example in the center marker). 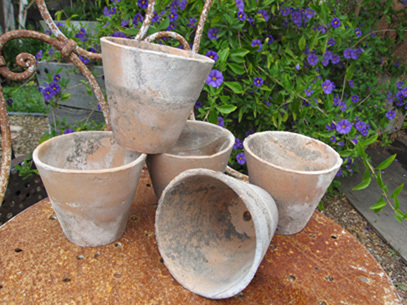 These come to you with the patina only time well spent in a garden can create. Fabulous weathered zinc markers, created for Rose Varieties. From an English antique dealer's collection during a recent visit across the pond. 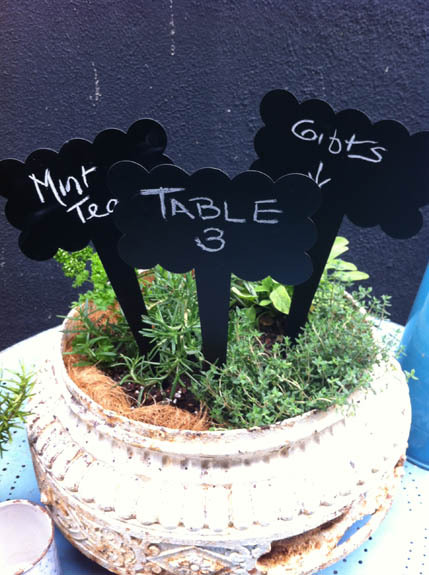 Magical addition for the well-tended garden. Overall 13" long; marker measures approx 4 x 1 3/4". Deep cleaning will reveal a blackened marker covered by aged patina (shown as example in the center marker). 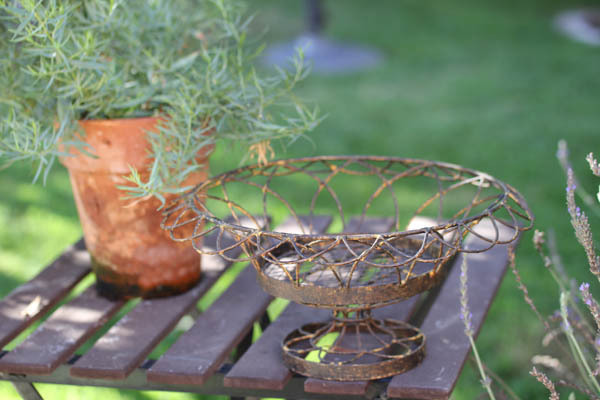 These come to you with the patina only time well spent in a garden can create. TEMPORARILY SOLD OUT. Darling French Greyish-white wire with removable frosted glass cylinder. 11 H x 4" Diameter opening. 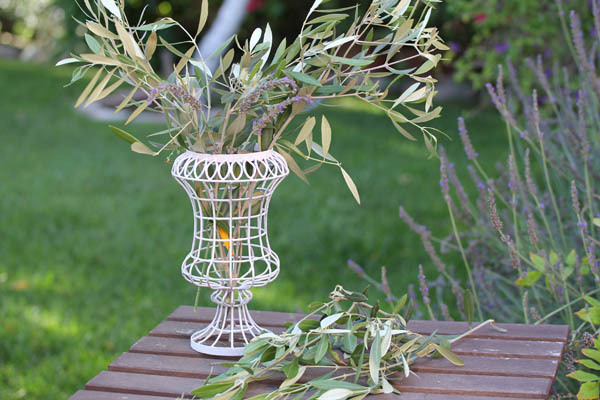 Just lovely for centerpieces! These have been very popular with event planners and brides and now we're offering it online! They look incredible with moss or a floral design, but also so beautiful in their simplicity as it, don't you agree? Removable lid. Overall measures 20" H x 9" diameter at widest point. Powder coated metal offers a slightly distressed look, but should be treated with a clear NO RUST if left outside. Many have spray painted these to match their design decor. Sold individually. Only one available. Fabulously dented here and there showing all kinds of love. NO HOLES; these hold water and more! No labels on them. Sold individually. You are purchasing this exact one in the photo. Measures approx 13 x 17". France, circa 1950. Fabulously dented here and there showing all kinds of love. NO HOLES; these hold water and more! No labels on them. Sold individually. You are purchasing this exact one in the photo. Measures approx 14 x 22". France, circa 1950. 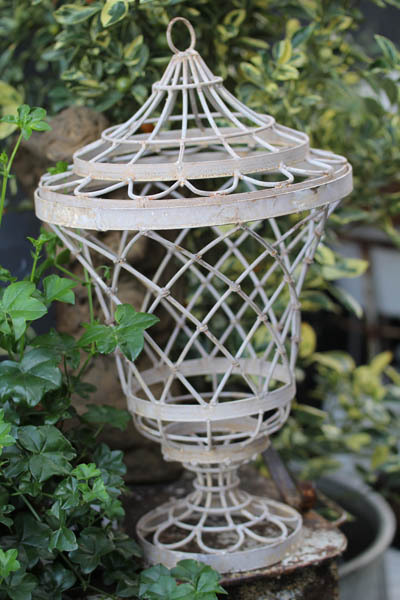 Fabulous for the garden or holding fruit in the kitchen with it's elegant pedestal design. Sturdy metal is hand rubbed therefore variations in metal coloring adding to the unique patina. This piece has been powder coated but if you wish to leave outside in inclement weather, we recommend applying a matte spray of No Rust to prevent rusting. Measures 14.5 diam (with a 7" interior base) x 7" H. New; two available. ONE AVAILABLE. As seen as a prop we placed in Food Network's "Real Girl's Kitchen with Haylie Duff". 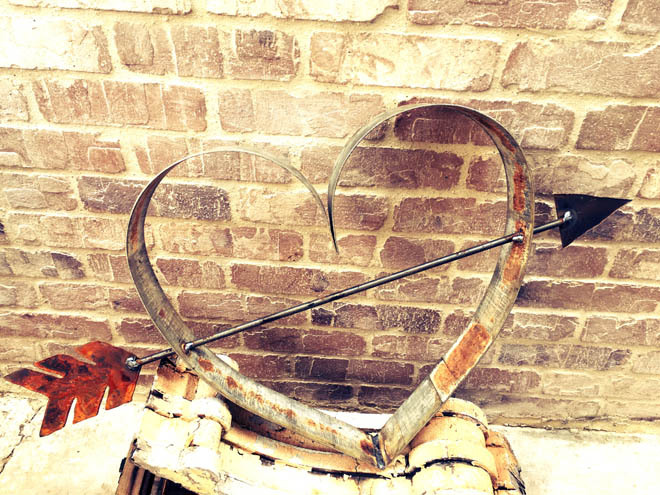 Repurposed metal fashioned into a heart with rusted arrow. Fabulous indoor or outdoor use. Sold invididually; each varies slightly as all hand fashioned from vintage wine barrel metal rungs. Small measures: 19 x 16 x 1.5 Thick". SOLD OUT. Similar to the smaller version seen as a prop we placed in Food Network's "Real Girl's Kitchen with Haylie Duff". 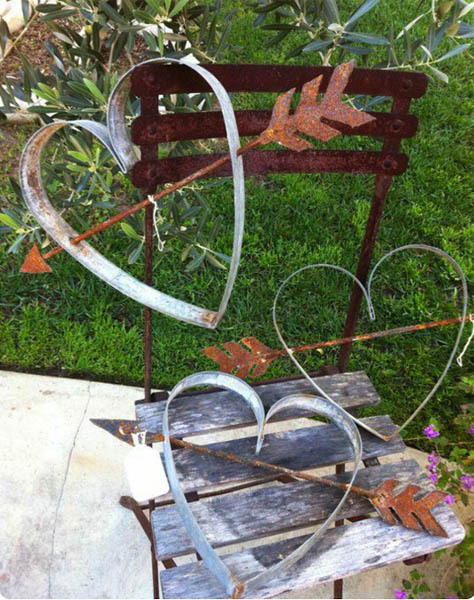 Repurposed metal fashioned into a heart with rusted arrow. Fabulous indoor or outdoor use. Sold invididually; each varies slightly as all hand fashioned from vintage wine barrel metal rungs. Medium measures: 28 x 18 x 2 Thick". 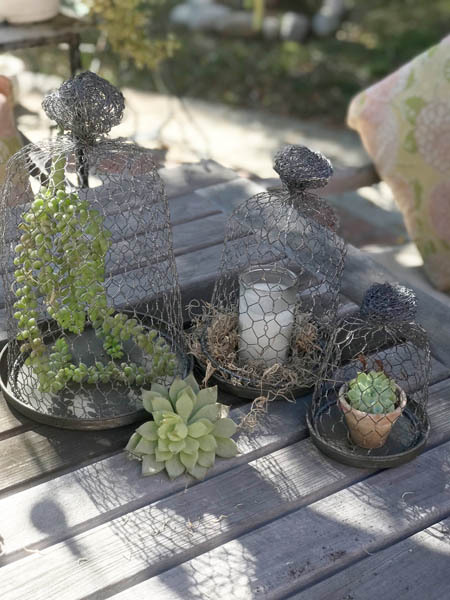 Metal and mesh wire Cloche set of 3 (includes base) are such darling additions to any garden. Largest 12 H x 8.5 Wide down to smallest 7 H x 5" wide. GIFT OF ONE SMALL FRENCH MINI POT INCLUDED. New. Only four sets available. Plants and candle not included. Reg. Price $96.00 $49.00 On Sale, Lucky Dog! Classy and sophsticated. Measures approximately 6 1/4 H x 5 3/4". 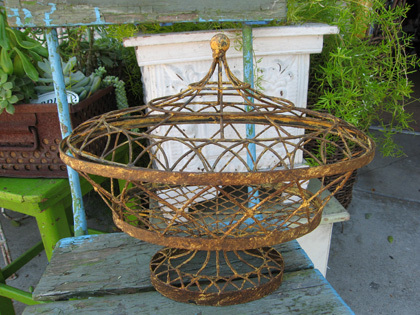 Fabulous French Wire Twist Basket. For our studio clients, this is our go-to "basket" to fill with all kinds of French bath products. Lovely with plants, too!. Power coated to live happily outside as well as in. 18" Tall x 19" W x 12" deep. Handcrafted thus each item will vary slightly. Fabulous for the garden or holding fruit in the kitchen with it's elegant pedestal design. 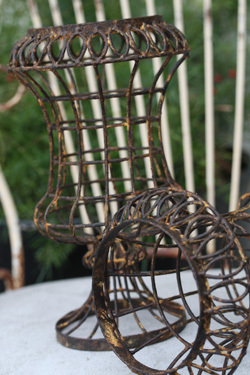 Sturdy metal is hand rubbed therefore variations in metal coloring adding to the unique patina. This piece has been powder coated but if you wish to leave outside in inclement weather, we recommend applying a matte spray of No Rust to prevent rusting. Measures 23 diam x 12" H. New; ONE available. Narrow bird bath fits in nestled in the most delicate of spaces, allowing birds both safety and privacy. Edges are thicker giving a spot to perch while they drink. Cast iron. Rusted. Approx 19" L x 3.5"
Classy and luxurious outdoor fabric fashioned into pillows. Fabric from Silk Trading Company is Los Angeles and used in a set design so some minor wear from use. Machine washable; line dry.. Hidden Zipper. Set includes two 21" pillows and three 16" pillows. Reg. Price $515.00 $210.00 On Sale, Lucky Dog! Beautiful planter box of resin and clay; images on all four sides. No holes so liner can be used or plant directly inside. Measures approx 11 x 5 x 6. Circa 1960. Reg. Price $115.00 $74.00 On Sale, Lucky Dog! 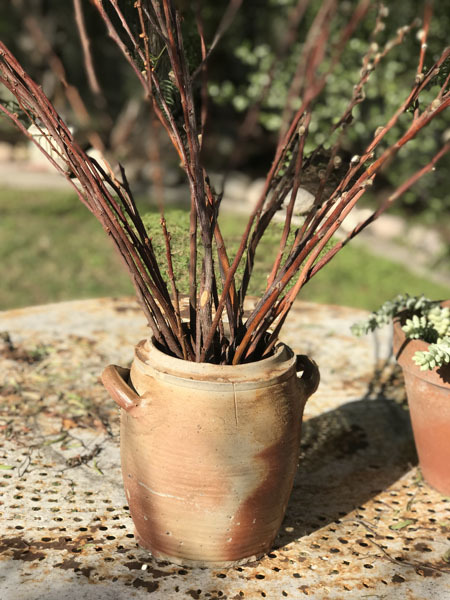 Fabulous outdoors or in, this antique tureen holds water for fresh branches or flowers, or looks amazing on its own. Discovered in Aix en Provence. Larger sizes available to ship via Freight Carrier; this item shown ships UPS. vintageweave@gmail.com for more info. Measures 9" H x 9" Wide with two handles. France, circa 1940's. Reg. Price $189.00 $119.00 On Sale, Lucky Dog! ONE available. 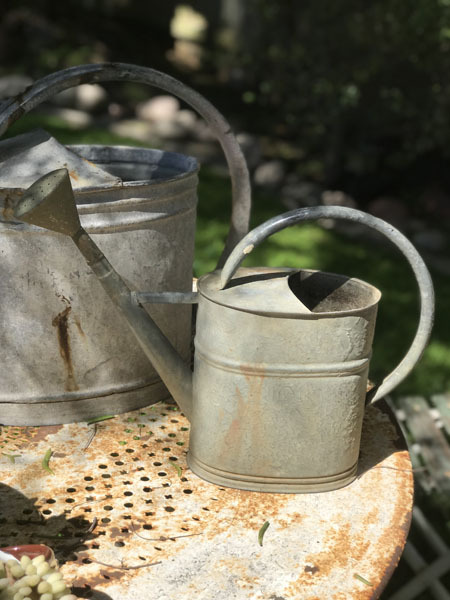 Smaller version that the typical French watering cans. Easy to handle and NO HOLES. Zinc. Measures approx 12" H (15" spout height) x 11". France, early 1900's. SOLD. 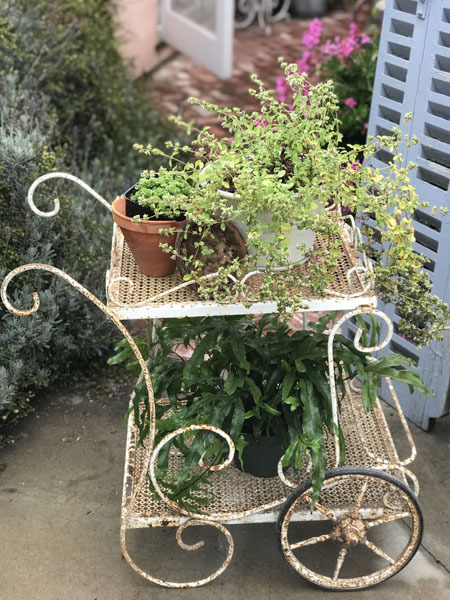 Darling and rare metal with working wheels from a Paris flower shop. Measures 30 x 17 x 28 H" Paris, circa 1930.